Deer Island is located just North of Alexandria Bay, New York. It is a fifty acre island containing diverse topography and a varied shoreline. The southern perimeter of Deer Island faces the American shipping channel while the northern perimeter faces the Canadian channel. It has several protected coves and a small bay and is currently mostly forested with White Pine, Black Oak, Hemlock, and Sugar Maple. 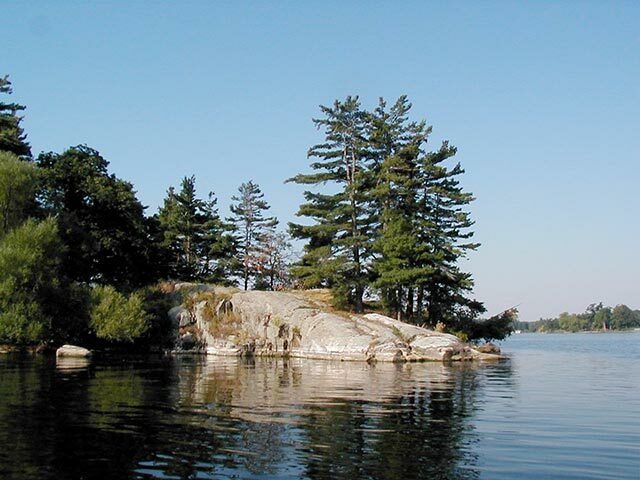 Deer Island was one of the first islands in what has become known as The Thousand Islands region to have been sold as a summer retreat. In September of 1856, Deer Island and a smaller 7 acre island nearest to it on the northeastern edge was sold to a Mr. Samuel Miller for a sum of $175. 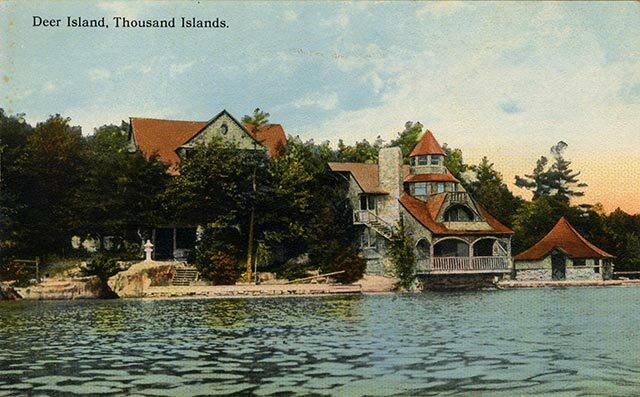 Through the turn of the century, this region became a favored summer retreat for the American elite as many wealthy families purchased islands and constructed ever more elaborate and decorative cottages. Most of these homes were featured in tourist books of the time since the many hotels also attracted the less affluent vacationers and the homes of the millionaires were no less of interest to the tourist in 1800 than they are today. Yet, photographs of the Deer Island structures are not as easy to locate despite the fact that the Island and its accouterments were apparently no less elaborate and interesting as the many of the other cottages. At some date prior to 1949, Samuel Miller’s son, George Douglas Miller, gave a building on the island to the Yale University’s Skull and Bones Society. This building was known as “The Outlook” and was built largely of stone with a wooden upper structure. It was reported to contain fifteen rooms and housed a valuable collection of antiques and books. The building, and its contents, was destroyed by fire in the late 1940’s. The Skull and Bones Society currently appears to own the entire island however, of the original larger cottages on the island, depicted in old postcards, only one remains along with two or three smaller cottages. There are at least three obvious ruins on the island. Please do NOT contact us about visiting this island or anything related to conspiracy theories about Skull & Bones. NewRuins has absolutely no association with the ownership of this island! Do NOT expect replies to such inquiries. "Because things are the way they are, things will not stay the way they are."